Unlike most European countries, Norway isn’t really known for its cities. Sure, Oslo is a nice enough place and well worth a stop, but Norway is all about fjords and glaciers and mountains and ancient fishing villages. There is a reason those Vikings kept coming back with their ill-gotten gains, Norway is a very pleasant place, especially during the summer with its midnight sun and mild weather. In Oslo, visit the Akershus Fortress. Bring a camera because the views of the harbor are worth it. And don’t miss Oslo’s Vigelandsparken Sculpture Park. See the midnight sun or experience the northern lights, depending on when you visit. Hike Preikestolen. 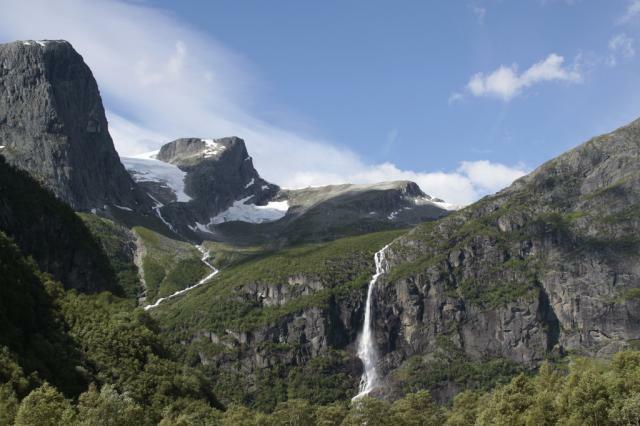 It’s not a difficult hike and is one of the highlights of any trip to Norway. Bergen is the second largest city in Norway, but it’s the gateway to the reason most visit the country at all. This walking-friendly and historic town is where trips begin visiting the western fjords and is also near Central Norway’s highest mountains and largest glaciers. Try the food. Salmon is a must. Eat reindeer (not for fans of Rudolf). Drive through Lærdal Tunnel, the longest tunnel in the world, on the road between Bergen and Oslo. Check out the markets and don’t avoid visiting a Christmas Market. Climb the Stairway to Heaven, the longest wooden stairway on Earth, located in Flørli. Ride a ferry through the fjords. Read: Planning a Trip to Scandinavia. If you are coming from more than a country or two away you’ll want to fly into Oslo Airport (code: OSL). It’s the country’s largest and your best chance of getting a good deal. It’s not close to Oslo’s center, but there is a high speed train connection that goes into the center as well as cheaper local buses. If you are coming from within Europe you can book a flight into Bergen International Airport (code:BGO). There are shuttle buses and cheaper local buses that can get you into the city center. Read: On Track in Norway: A Scandanavian Rail Journey. May through October are the months to visit Norway as some more remote places close outside of this season completely. Of course you can find hostels in Oslo year round. The seasons are more critical when searching for hostels in Bergen. May is a popular month to visit and the better and cheaper places can sell out early so plan ahead. Read: The Last Remaining Russian Settlement: Svalbard, Norway.